Do you know that the HideMyAss now offers a 7 Days VPN Trial? And You can use the HMA! Pro VPN for 7 Days at free of Cost. However, It asks for Credit/Debit card detail at checkout but doesn’t worry it won’t charge you until the trial will not end and just before the trial ends if you remove the card detail from the HidemyAss account, then it will not cost anything, and your subscription will be expired. So you can go for the trial without any hesitation and try it for seven days with full of potential. It is most of us habit that without trying we don’t want to spend anything, and it is a good thing. Why? Because we do not want to waste money. After a successful trial if we got satisfaction with the service, then we can confidently go for the bigger plan. So, if a VPN company is giving you a free trial, then it is a sign of trustfulness. The Company knows without the customer trust, they can’t achieve their target. If customer satisfaction increased, they would get more and more sales. Hence, most popular VPN providers offer a Free VPN trial. How to Get HideMyAss VPN 7 Days Free Trial? When you directly go to HideMyAss VPN website, you always see Buy Now button. Which means you will need to purchase the service before use. So in the first attention, you will not find the information for the HideMyAss Free trial. But HMA! has a dedicated page where they explicitly mention about the Free VPN Trial. 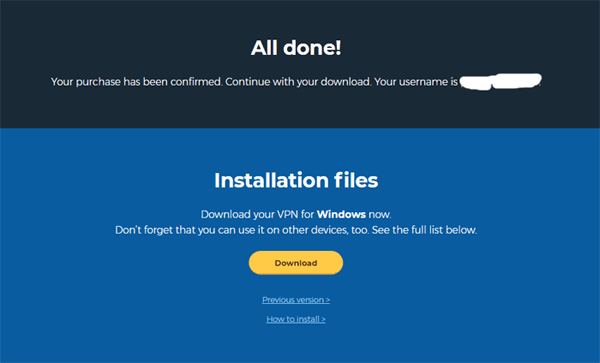 So here I’m sharing the link, as well as the full signup process with which you can quickly start using HideMyAss VPN trial without paying anything. First Go to the HideMyAss Free VPN Trial page. And you will see following Download free VPN trial page, here click on the Free Trial button to go further step. Next, you will to select the payment method and fill the payment detail, don’t worry HideMyAss will not charge you anything until 7 days. Once your trial expires, HMA! will start charging according to their plan. 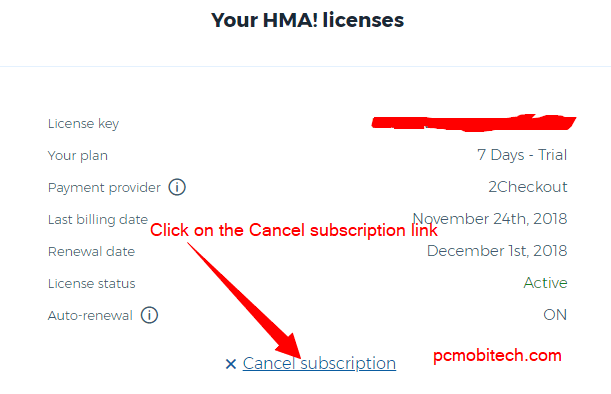 After trying the HideMyAss VPN, if you don’t like the service and want to cancel the subscription, then anytime within 7 days you can remove the Card detail and can remove the subscription from the HideMyAss account so that HMA will cancel your service after seven days will not charge you. Most people don’t like to share card detail, if you’re one of them, then you can use PayPal and Skrill, these are the safest online method to buy the products online. 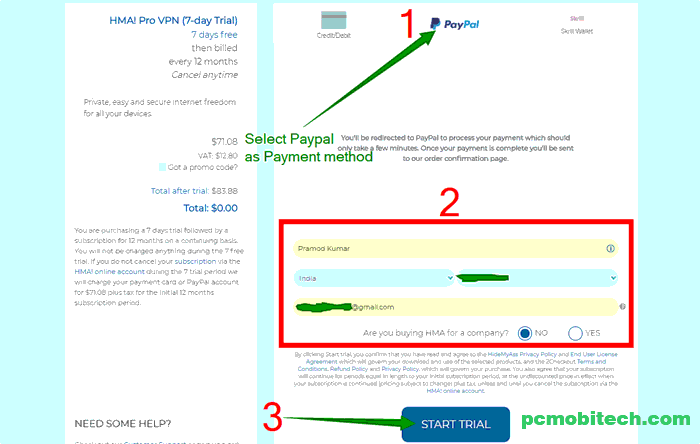 Here I’m also using the PayPal as the payment method, After making the right selection of payment and filling the necessary detail such as Name, Country, Email ID, and purpose of use HMA, click on the START TRIAL button. 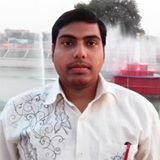 As I have selected PayPal, so I have redirected to PayPal Payment Gateway, where I need to login to my existing PayPal account, if you don’t have then first create one. 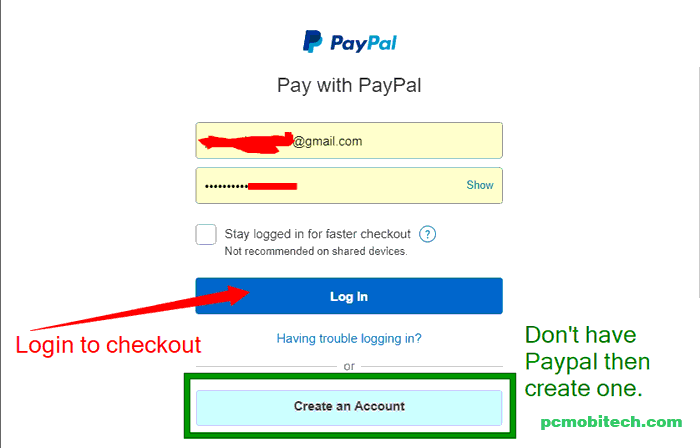 Read this: How to Signup PayPal Individual Account. After filling account information, click on the Log In button. Once you login to PayPal, if you have connected your card into the Paypal account, then click on the Agree and Continue button. You have successfully linked payment information to HMA VPN account. 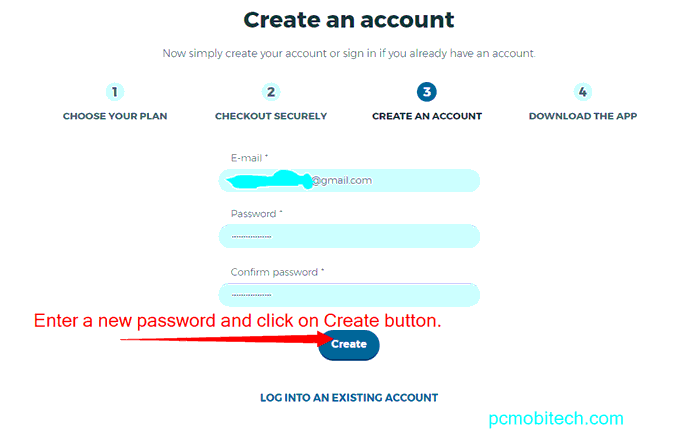 Now enter a new password and confirm it, after that hit the Create button. And you have successfully signed up for free HideMyAss VPN trial account. So now download the HideMyAss app for Windows, Android, Mac OS, iOS, Linux, etc. and activate the app with a key which you have received in an Email after signup complete. That’s it, now enjoy the free trial. 3 best free PC cleaner software. ExpressVPN Coupon, Discount Sale: 49% Off. StrongVPN Coupon, Discount & Deal (62% Off). As soon as account signup completes, you see the All done! Page. From this page, you can download the HideMyAss application and can start using the VPN service for free. HideMyAss free trial only valid for 7 days, after that you will be charged as usual according to their VPN plans. After testing if you find the service useful and it is fulfilling your requirement, then you can continue with existing account and enjoy the service. However, if you didn’t see the service as they promised, then anytime you can cancel your account within seven days. You won’t be charged, and your VPN subscription will end immediately. To Cancel your HideMyAss VPN Subscription, login to your HMA account and under the Your HMA! licenses, click on the X Cancel subscription link. and your license will be canceled after that, and you will not be charged for the next billing cycle. Have you taken HideMyAss VPN free trial? Please share your experience via comment box.